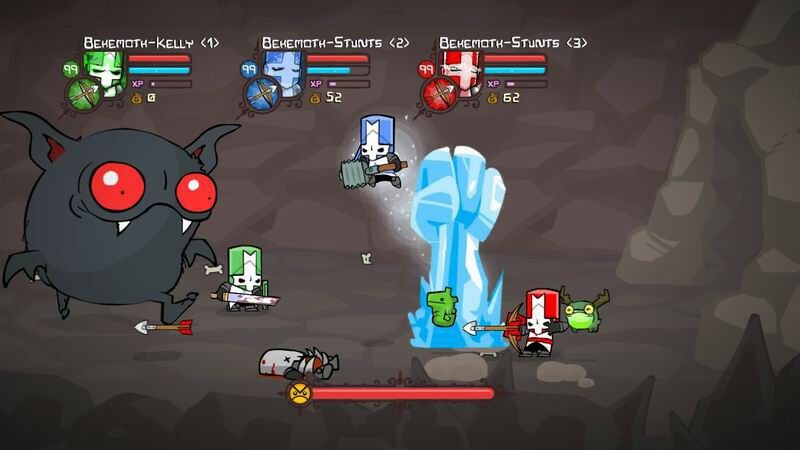 REVIEW - Castle Crashers: Remastered - Use a Potion! 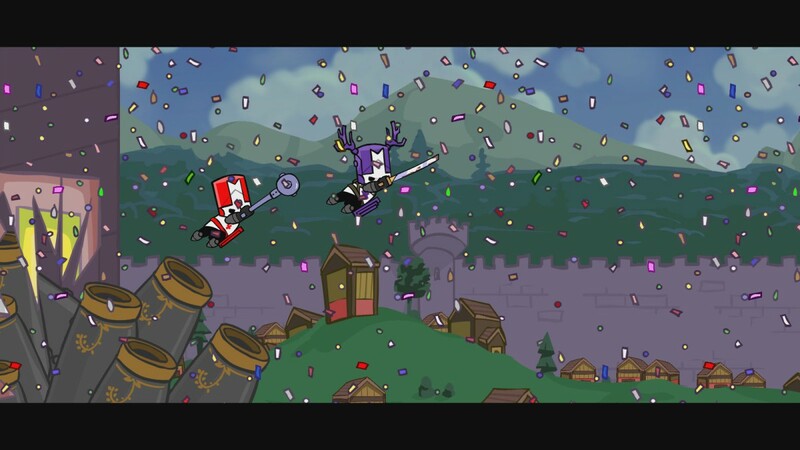 I love Castle Crashers. I really do. When the original release hit the Xbox 360 back in 2008 I was absolutely hooked on the game. I poured so many hours into it across co-op, single player and the mini-games. Imagine my joy to see that it was getting a remastered release on modern consoles; I could start a new adventure in developer The Behemoth’s land filled with Knights, Wizards, Princesses and farting bears. Boy, it is good to be back. Gameplay consists of you battling through a constant barrage of enemies, working through the game’s many levels. This is done through basic combat; you’re armed with a weapon that you use through careful button bashing to fight your way to victory. Weapons are plentiful in the game; you may start with a sword, a mace or perhaps an axe but by the end of the game you would’ve used a variety of more creative weapons such as a carrot, a lobster, a candle stick or even a fish. 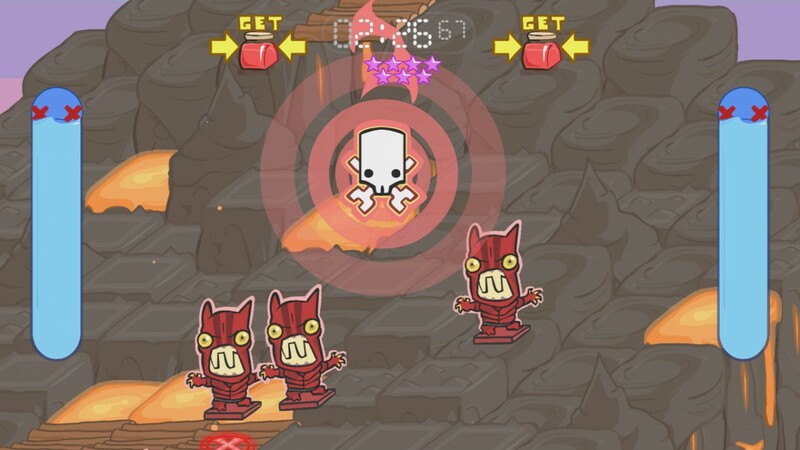 There’s no lack of creativity with the arsenal featured in Castle Crashers. Besides the weapons you also have access to a variety of magic, each character in the game offering a different set. Enemies you encounter get trickier as you progress through the game; luckily defeating enemies awards you with experience points that can be used to level up. You have strength, magic, defense and agility attributes to improve – you’ll require balanced upgrades if you’re going to survive the many trials that will face you in the game. Levelling up will also award you with different attack combos; whilst you’ll only have access to a basic set of move to begin with, by level 50 you’ll be smashing enemies apart with ease. The progression is wholly satisfying, albeit slightly minimal. You’ll travel across a variety of stages as you look to save the Kingdom – starting at your Home Castle you’ll venture through the Thieves’ Woods, Medusa’s Lair and even a Space Ship along your travels. The environments all look fantastic; everything is hand drawn and absolutely full of colour and tiny details. The remastered edition sees an upgrade to the visuals with improved textures and an improved frame rate of 60 fps – the game has never looked so good. The same quality is apparent with character design too. The playable characters, along with the enemies, look great. Whilst the Knights all have a similar design with the main difference being their colour, the variety of enemies is great: you’ll encounter enemy knights, trolls, barbarians, demons, imps, skeletons and even aliens. Creativity is blooming and it’s both beautiful and absolutely insane. Boss battles pump the creativity up even further; the highly entertaining encounters are plentiful, each boss requiring a bit more thinking if you’re going to take it down. Luckily, whilst Castle Crashers is full of enemies looking for your blood there are also plenty of allies who will help you out. Similar to Golden Axe, you are able to ride upon the back of mounts who offer extra attacks. My favourite is the deer; it’s just fitting for the absurdity of the world. You can also find animal orbs, little animal mascot type creatures that support you on your adventure, offering a range of abilities including stat buffs or experience boosts among many more. These creatures are ridiculously cute, and you’ll find yourself carefully hunting through each level trying to find as many as you can. 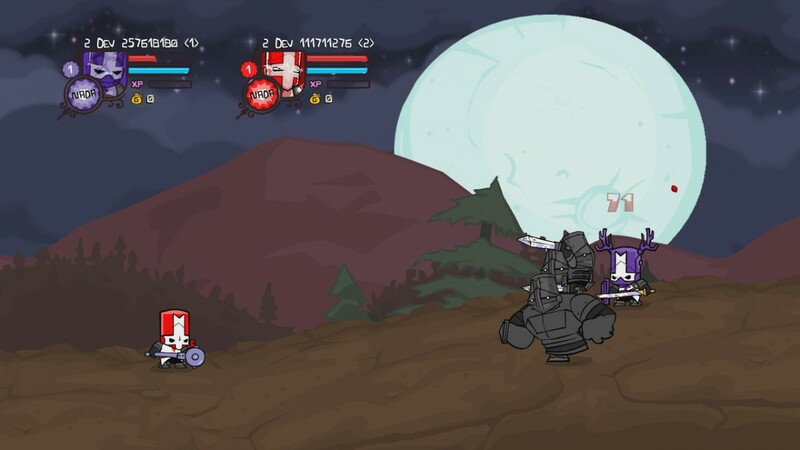 Of course, the best kind of assistance in a game like Castle Crashers is that of a human; fortunately the game boasts both local and online co-op for up to four players. This is where Castle Crashers is at its very best; whilst single player is fun to play through, nothing beats taking down the Dark Wizard with a group of friends. It’s chaotic, but so entertaining. There’s also a variety of multiplayer mini-games to play through, including new addition ‘Back Off Barbarian’ where you carefully jump through levels avoiding enemies. If you just want to battle though, you can play ‘Arena’ mode and take down a constant stream of enemies on your own or with a friend. 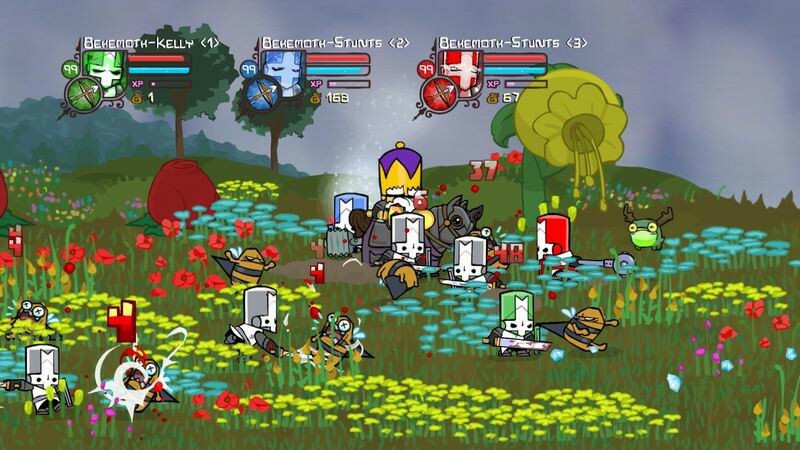 Despite being a huge fan of Castle Crashers, I also recognise that it has some flaws. Outside of the multiplayer, the game can feel a little repetitive. The only real variety to the gameplay are the boss battles; levels never really feel different from each other apart from in its aesthetics. Whilst this isn’t such a problem when playing with friends, it becomes all the more apparent when playing alone. Most players will notice the game doesn’t really do anything new either; there’s nothing original or innovative here, just a mash of features that we’ve seen in countless scrolling beat ‘em ups before. I don’t really see this as too much of an issue though; while it might not do anything new, it does everything well. Unlockables start to feel a bit redundant though – whilst animal orbs are enjoyable to collect and offer perks, the over twenty characters to unlock in the game aren’t so rewarding. Variety is nice, but you feel so under-powered starting the game with a new character that you won’t really have much motivation to do so. I’ve played a ton of games in my time and there’s plenty that have made a lasting impression on me; Castle Crashers is one of those titles. With the remastered edition we have all the classic goodness of the game, just a ton better. What more could you want? The graphics are improved, it runs at 60fps and has a whole new community to play through the game with again. Sure, the flaws the original had might still be there, but that doesn’t stop Castle Crashers being an un-missable game that you need to buy. Right now. Do it.